MAC Ruby Woo // One of the cult favorite MAC products, this is by far my favorite red lipstick. It's a matte formula, so I need plenty of chapstick before I put it on, but the staying power is impressive. And the blue base makes my teeth look supah white. Revlon Color Stay Just Bitten Kissable Balm Stain in Crush // Though a painfully long name, the formula and color of this product is fabulous. It goes on shiny, but dries down quickly to a more matte, long lasting formula. The color stays put for a long time, and I kind of prefer the faded color a bit more. Flattering without being too much. Revlon Super Lustrous Lipstick in Berry Haute // I love this color. The purple brings out the green in my eyes, but it's not too much of a color that it makes me look weird. And the tube feels verrrryyyy classic fancy old lady. Stila Stay All Day Liquid Lipstick in Patina // This is my favorite everyday winter color. The formula is kind of insane - once it sets, I basically have to chisel it off. It's a pretty basic color - pinkish brown, which I love. It works with every makeup look and outfit. YSL Rouge Volupte Sheer Candy in 15 // This is the spendiest lip product I own, and you could absolutely find something similar for less, but dayum doesn't the packaging make me ridiculously happy. I mean, the lipstick is gorgeous, and the juicy rose shade works as a great everyday, no mirror required option, but the packaging man. So fancy. 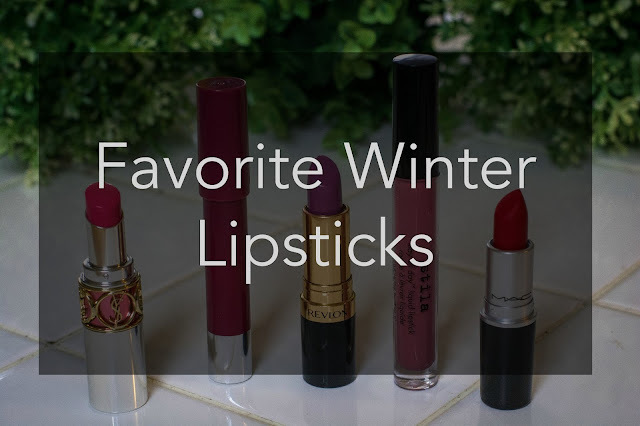 I've recently started getting into lipsticks and colors so I love this post! The berry hue is fabulous! I always admire when people can pull off beautiful purple lips. One day I'll be daring enough to try it. Thanks for sharing!